Interferometric optical test precision is primarily limited by the interferometer transmission sphere quality. The CaliBall is a means of in-house transmission sphere calibration using the Random Ball Test. 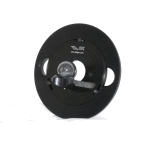 The CaliBall is designed so that it can be used immediately before or after a critical test of an optic without changing anything in the test setup other than inserting or removing the CaliBall itself. Transmission spheres are factory calibrated, but shipping, handling, thermal and other environmental effects degrade the factory calibration precision. The CaliBall eliminates these uncertainties by calibrating the transmission sphere in the test set up, an assurance that the interferometric test results are precise. The CaliBall uses averaging of random patches of the CaliBall to calibrate transmission spheres exactly the same way surface roughness interferometers are calibrated by averaging random patches of a plane surface. 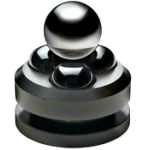 CaliBallTM is a 25.4 mm diameter, silicon nitride ball and kinematic mount used to calibrate phase-measuring interferometers by determining the errors in the transmission sphere reference surface. It is located with its centre at the focus of the interferometer transmission sphere and aligned to better than one fringe. A measurement of the ball is taken, the ball picked up, arbitrarily rotated and replaced in its mount. The centre of the ball will return to its original position due to the kinematic mount. Another measurement of the ball is then taken. This process is repeated about a dozen times and the interferograms averaged. The average represents the errors in the transmission sphere and interferometer because the ball is extremely round and the small, uncorrelated imperfections of the ball average to zero. The calibration can be done in as little as 10 minutes and the results are difficult to dispute. CALIBALL™ I is for either horizontal or vertical interferometer set ups but it requires an x-y-z stage to position the CaliBall centre at the transmission sphere focus. CALIBALL™ II is for horizontal set ups which bayonet mounts into a typical Zygo or ESDI 4″ mount.